When I was eight years old I sat in a church pew behind an old (whatever “old” looked like to an eight-year-old) couple and delighted in the fact that they were holding hands. I stared at them from behind the entire one hour of mass (and Catholics know I mean exactly and only ONE hour) and dreamed about the kind of marriage I would have one day. I decided that a test of how good my marriage was would simply be that my partner and I would hold hands even when we were old. I spent that hour in a fantasy of marriage. Everything I imagined during that hour was beautiful and perfect and exactly the thing that was worth searching and waiting for in my life. I knew that I would not settle for anything less. My marriage was going to be that kind of perfect and my partner and I would want the same things. It all was so simple then. 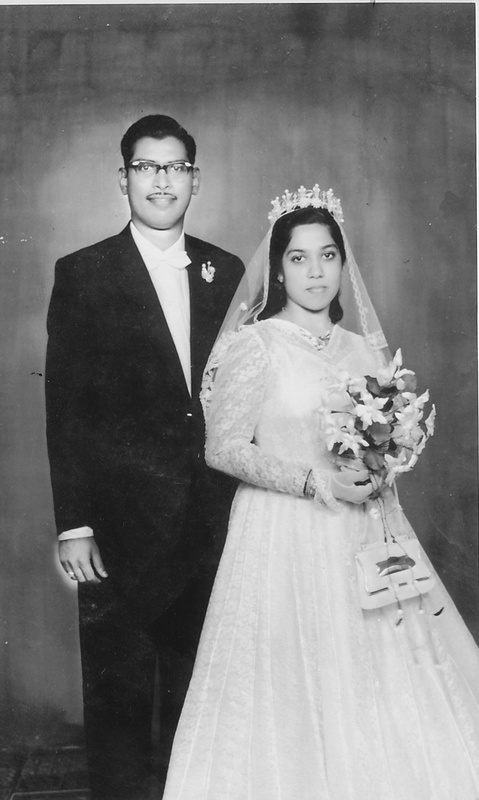 My parents on their wedding day, July 7, 1963. I also used to think that my parents’ marriage was just a little less beautiful and perfect because it began as an “arranged” marriage. Growing up as a Goan in Africa and NOT immersed in the traditions and culture of Goa, I was less inclined to learn and abide by that part of who I am. For me, the stories that appealed to me were the romantic stories in which love began with a chance but divinely intended encounter in which one fell deeply and madly in love with another person and then spent the time between then and a wedding in pursuit of the moment of vowing eternal love for each other at the altar. Beyond that, a perfect and beautiful marriage consisted of continued love and a quieter passion, some disagreements and simple solutions to them all. So the idea of my parents having come together through an arrangement was never quite appealing to me. How could such an arrangement be romantic or fantastic in any way? Real love and marriage had to have some spark and mystery and passion from the start. I have often heard that in Western cultures, you marry the one you love but in Indian cultures, you love the one you marry. I get this now and I understand that no matter how love begins, whether across a crowded room when you lock eyes with THAT person, or in a smaller living room in which your aunties introduce you to a “good” person with a “good” family, when and how love begins is not necessarily an indication of how beautiful the marriage might be. My parents were introduced in a tiny living room by their aunties and the story they tell us is of how my mother was asked to serve the guests tea and she, not in her own space and not used to this task since she was the youngest girl in her family, unknowingly spooned salt instead of sugar into the tea and offered her potentially future husband a cup – which he drank without a complaint. Prior to that fateful day, the search for a wife for my dad, whose family had come from Tanzania was nearing its end at 170 days of the 180 that were allotted. Meanwhile, my mother had made a pact with God and was on day 80 of the 90 day “ultimatum” she had given God. The pact was that if a suitable man did not show up by the end of the 90 days, she would go on to become a nun. She meant it (and at times I wondered if she regretted not simply heading to a nunnery without the pact). With only 10 days left of their time limits, their meeting and consequent union was, in every way, a marriage that was wrought with Divine intervention and the universe had certainly conspired in their favor. They were both a bit shy and equally anxious and a little bit of love had been stirred into that salty cup of tea that was just enough to spark the beginning or the middle of the Grand Design. The wedding happened seven days later and three days after it my dad got on a ship and headed back to his home in Tanzania to wait and prepare for his new bride while her paperwork was put in order for her to move across the ocean to a continent she had never set foot on. For my mother, it was the beginning of a lifetime of blooming where she was planted (but that’s for another blog). The fantasy and romance I dreamed of in that church pew when I was eight was quite different from the reality of what I witnessed of marriage everyday through my parents’ union. I learned many things from watching my parents being married to each other – some lessons I fought and some I tucked away as treasures to be opened as needed. Theirs was a no-nonsense approach to life and decisions, and verbal and physical displays of affection were rare enough that I strain to recall any. My parents did seek out new and exciting experiences and always made time for our family to be together or with friends. They even took two big trips, sans kids, to see new parts of the world – a first for the kinds of families they were born into. What I witnessed was a no-frills approach to family life and a simple acceptance of the arrangement that was marriage. Fantasy it was not, but beautiful it certainly was. It took me many years to see this. Their marriage was beautiful in the way that life is beautiful. Beautiful in the way that life is beautiful because it is a perfect blend of hard and joyful and happy and sad and skips and trudges and sometimes hanging on by a single thread because that is the thread that saves you and the most essential one that you had to notice – which is why all the other threads had to get cut. The hard parts of marriage were in plain sight – the hurting, the forgiving, the surprises, the laughter, the unexpected and the acceptance and commitment through it all were always in plain sight. The marriage I witnessed was, indeed, beautiful. Fifty years after that wedding day, on July 7, 2013, I, along with my four siblings and my new family, sat in a church pew behind my parents and witnessed them renewing their vows. This time they had chosen their words and vows to one another. This time THEY, not their aunties, had chosen to be there. This time they knew ever so deeply what marriage was. They held hands and their words expressed their gratitude and commitment to each other in simple but heartfelt words. It was the first time we heard them say, “I love you” to each other, but it was certainly not the first time they had felt it. And this time, in this church pew in Goa, I was filled with a similar delight I had experienced many years ago in the way marriage can be. This time, I also knew that a true test of how good my marriage is, would certainly be that we continued to hold hands. But this time, I understood far more deeply what it took to continue to hold hands through all that marriage is surely packed with. This time, I let go of the fanciful fantasy of marriage and saluted and honored the fifty years of marriage that my parents completed. Fifty years of doing this thing called marriage. Fifty years of sticking it out. Fifty years of hard and joyful and unexpected and occasionally hanging on by the one most important thread and knowing that it is the one thread that binds you to each other. Fifty years of daily commitment to continuing to do it together. Fifty years, five kids, ten grandchildren, and friends and loved ones too many to count. I was wildly and fantastically honored to be in that church pew celebrating my parents’ 50th anniversary and grateful to them for being my constants through the ups and downs of our lives. Happy 50th and very appropriately labeled, golden jubilee to you, Adrian and Clementina Fernandes! Many years since that hour of fantasizing in the church pew when I was a little girl, I sometimes catch my parents holding hands. And knowing more clearly what marriage has been for them, I have a deeper respect and awe of their ability to hold hands and pass the test of marriage I had set for myself through all of life’s servings of beautiful and hard and joyous and unexpected and routine.